Following Frankenstein, James Whale created a sequel that built on the mythology he crafted in the original film. Bride of Frankenstein (1935) is a great film with more cohesive story and characters. It picks up some moments from the novel and follows them down a different path. Unfortunately, it sacrifices some of the more interesting imagery and themes for this tighter narrative. The Monster learns to speak and acts a little more like he did in the novel. I'm not sure how cliche these were at the time, but music soothing the savage beast and the blind seeing the truth are both present in the same scene though these are shortened ideas from the novel. The opening just shrugs of Baron Frankenstein's final scene in the previous film, though it could have still happened, in favor of resurrecting and pursuing the monster. In fact, the Baron is entirely absent. I guess his work was done in the first film, but it show that even the best sequels can shrug off whatever from the original. We get a lot of stigmatization of 'the other.' The villagers gather at the beginning and absolve Henry Frankenstein of all wrongdoing, instead focusing on demonizing the monster. Even when the Monster has escaped them he comes across a group of gypsies, themselves outcasts, yet because they are even more different from him, they also shun him. The blind violinist is alone and longs for company and accepts Frankenstein out of a shared disability. Doctor Henry Frankenstein is played up as too much of a victim in this. He has essentially abandoned his creation (child) and is allowed a happy life. He was rightfully dragged back in by Doctor Pretorius and should have been held responsible for his crimes. Alas, the Hollywood happy ending must be preserved. Elizabeth has grown out her hair since the previous night! Continuity issues aside, she actually gets a bigger role in this. They kept on with the premonition stuff, but she actually gets more time with Henry and their relationship develops further. The Blind Hermit had a short but important role. His blindness was portrayed fairly realistically, though how he survives in the middle of the woods is anyone's guess. The Head Maid was over the top and unnecessary except for possible comic relief which she still failed at. They could have made time for so much more without that; plus, the Monster himself brings far more comedy. Karl is one of the assistants at the end. He is played by the same actor as Fritz, but this time he has leg braces. They should have just brought back and developed the relationship between Fritz and the doctor. The mob finally has pitchforks, scythes and pickaxes. They mysteriously acquire them between movies even! Mary Shelley was credited as "Mrs. Percy B. Shelley" in the frist film unlike every other person who worked on it. In this film, she is credited properly and even has a part in the story. 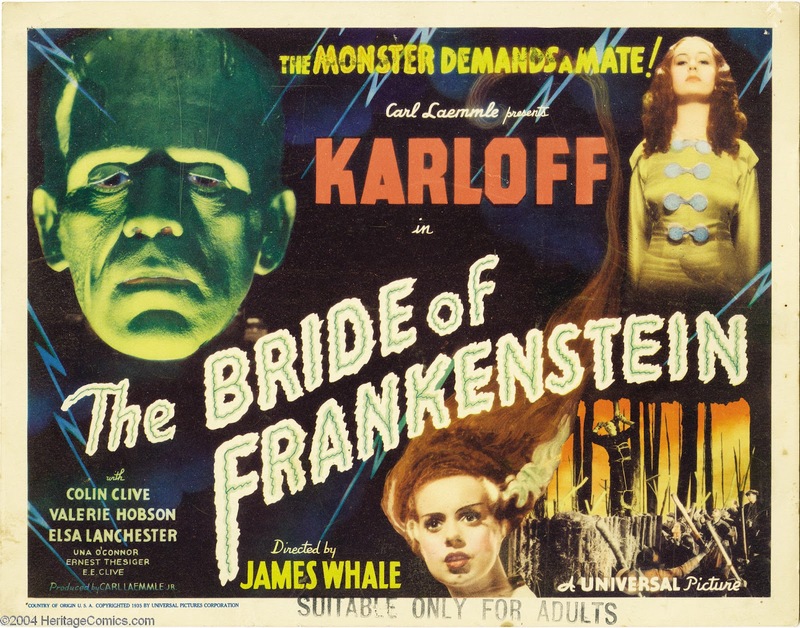 The actress who plays Mary is the same as the one who plays 'the Bride,' which is something that really works as Mary Shelley is often presented as siding with her monster. The Monster is once again the best part of the movie. Despite in over the top rampages he manages to be relatable, and this film provides a great ending for him. This is unfortunate as the next two films ruin it somewhat. The Bride is introduced very late in the movie. She doesn't have a lot to do, but she is well acted. The scenes between her and the Monster are heartbreaking. Doctor Pretorius is almost comically over the top. This is due to his obvious parallels to Satan. The idea of a crazy German scientist who perfects cloning, only to make tiny people in bottles, really takes the viewer out of the movie. Pretorious provides a clever manipulative, villain, but his inclusion is questionable. The acting for him is great, but the Monster could have easily carried the role and realized his faults all on his own. Pretoriius helps play up the Monster as more of a victim, but he would have been better as a complex figure. The sets and location work are fantastic. The crypt especially gave off the feeling of actually being in the catacombs beneath a cemetery. Plus they allow for a scene of Pretorius eating dinner and talking to skeletons, hilarious. The monster's fate is much more decisive and has a great sense of closure though closure is not something Universal Monsters do. Like the first, some sections may not hold up too well today, but it is definitely entertaining and hilariously campy. The themes continue to be strong, and the meat of the story concludes here. Check this one out for sure! This post was inspired by the 31 Days of Macabre Movies over at The Good, The Bad and The Magnificent. You should go check out his reviews!